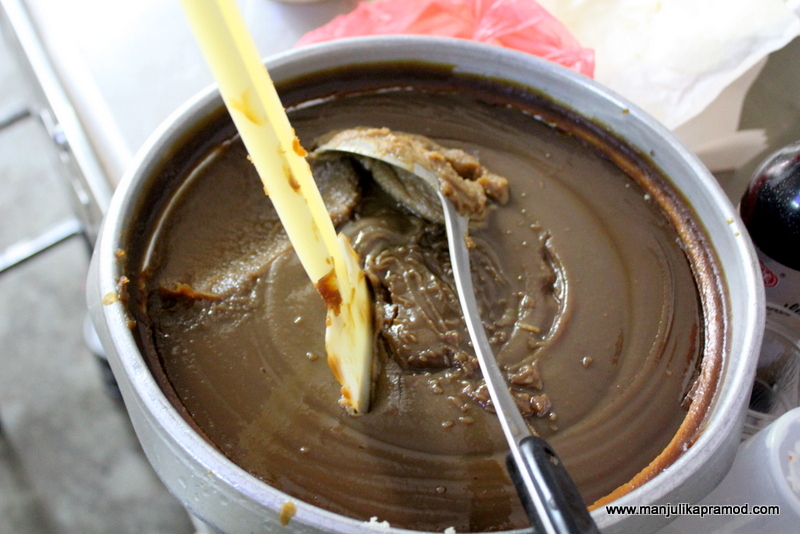 In this post I will transport you to the streets of Kuala Kubu Baru (KKB) in Selangor in Malaysia. When I first started working on my ‘Travel and Art’ series, I wondered if I would be able to find enough to share often but now that I am digging into my old archives of photographs and traveling to new places every month, I am just not worried. There is no dearth of creativity. There are lot of artistic streets and art works waiting to be discovered and I can’t wait to showcase art of every place. Since I always had an eye for street art, I have lots in my closet. And now, when I have been traveling to discover more and more street art, I have been surprised to find some great art work in unexpected places. That one stretch of wall in Periyar Tiger Reserve in Thekkady came as a surprise and I would say it was a great find of the year. This blog is equally interesting. I found these in the sweet, little market of Kuala Kubu Bharu, the district capital of Hulu Selangor District. The kaya puff on the pillar still reminds me of the KKB kaya puffs. Kaya puff is a local sweet from Kuala Kubu Bharu and it sells like hotcakes at the bakeries in this historical town center. What pulls me towards Street Art? I love admiring Graffiti and street art because they tell stories about the place, people and neighborhood. I like them more when these painted images on walls have a message or information for the people passing by. In my view, contemporary art can be a great way to talk about sensitive and thought-provoking issues too and they have been used that way in many places. Street art is not only a medium to express opinions about social and political issues but they also make the street more livelier and interesting. I love these color-splashed, funky streets more than the regular roads. Life is hectic and hurried and we have forgotten to stand and stare. I know people who wander the same lanes and streets for days and still do not notice these creative works that exist there or come up overnight and get faded. And then there are people like me who get excited to see every little small work of art. Where is Kuala Kubu Baru? Where is Kuala Kubu Bharu? 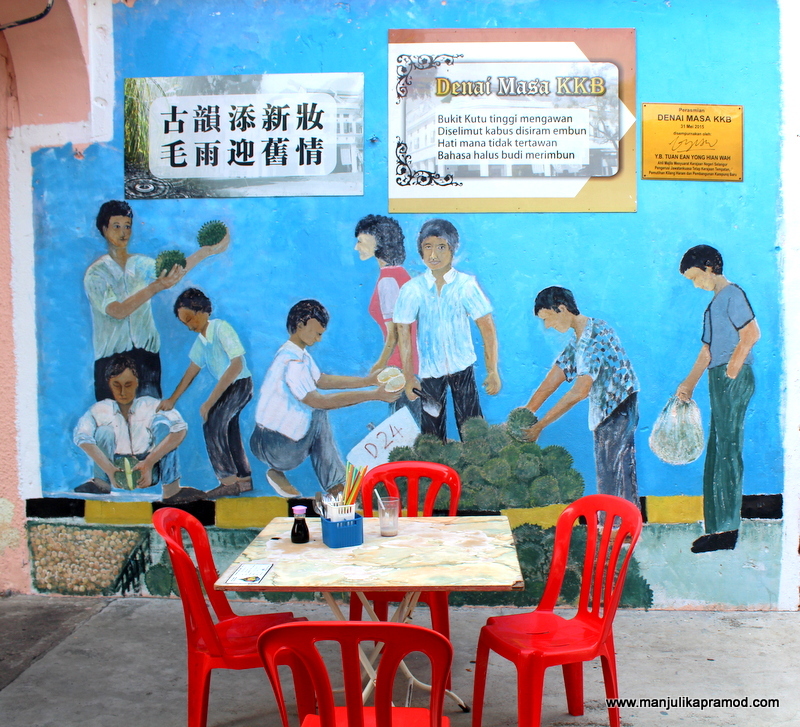 These wall art not only add colors and liveliness to this quaint, little market but also gave us a peek into the local ways of life. Kuala Kubu Baru town looked sweet and simple. It was quiet and peaceful even in the early afternoon. The shops were open but there were very few people around. There were cars on the street but nothing in comparison to the din of the cities. 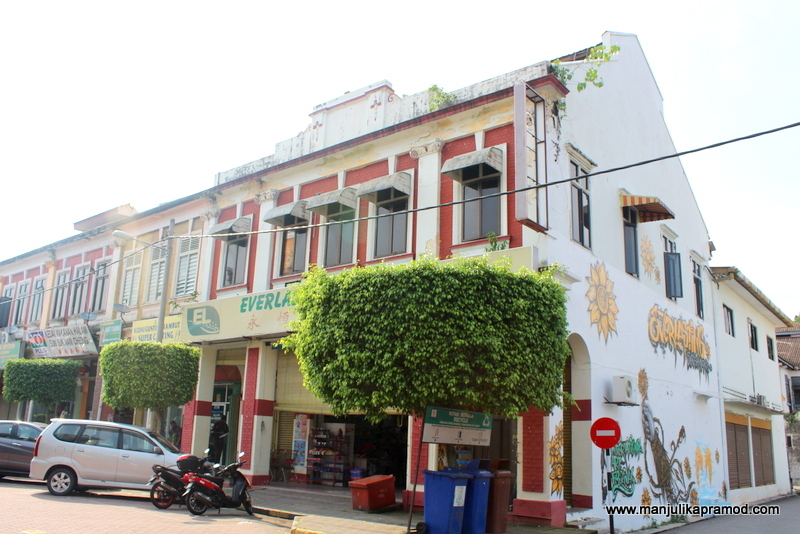 As I walked around, I observed the old historical buildings and the colorful shops. I was told that some of the eateries are very famous and full of locals almost all the time. Soon I discovered some of these wall paintings and I was totally in love with the market. The wall art and the vibrant colors spoke so much about the place. It conveyed about the locals, their work, their aspirations and the things they loved doing. 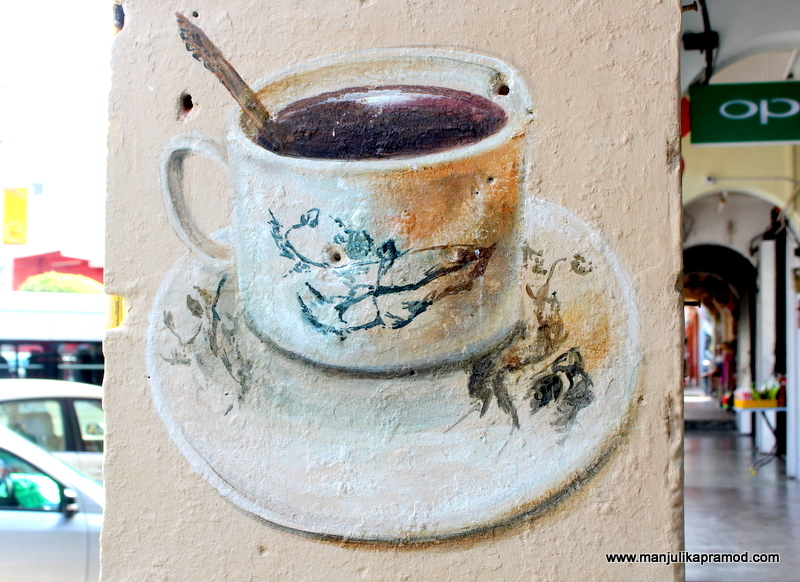 For example the wall art of coffee or the kaya puffs (local delights) signified the love for eating that this place had. 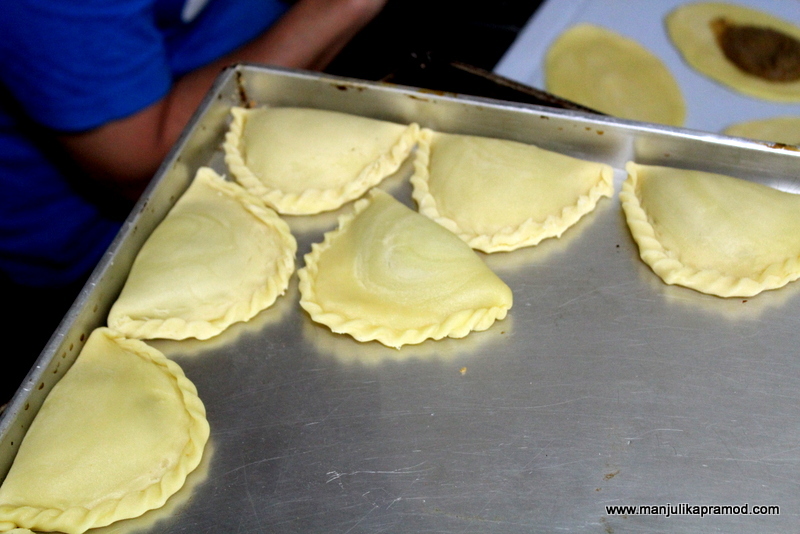 Also kaya puffs are one of the most delightful and relishing sweet of Kuala Kubu Baru. Here, I must tell you that Malaysians love eating and they take pride in their local delights. 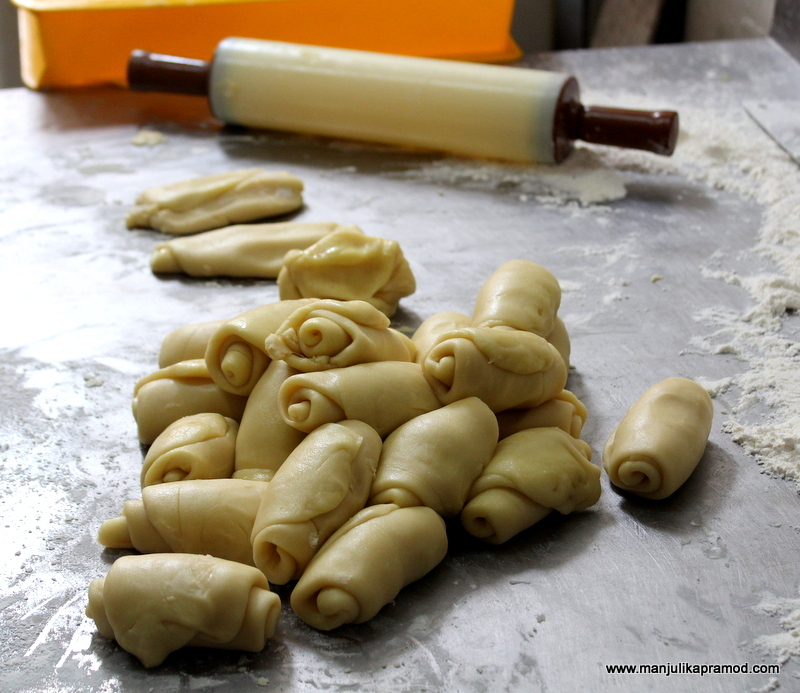 I was so curious about Kaya puffs that I actually went and saw how it was made in one of the famous bakery shops in the market. Every artwork in these narrow passages had something to say. The paintings depicted the local people, the surroundings, the beauty of the place. How could I not taste the famed Kaya puffs or KKB when even the walls were tempting me to do so. I walked into one of the famous and oldest bakery shop ( I have forgotten the name) and learned the process of making it too. There is a secret recipe to it and I was told it was a mixture of coconut milk, eggs, sugar boiled together for 10 hours and more. 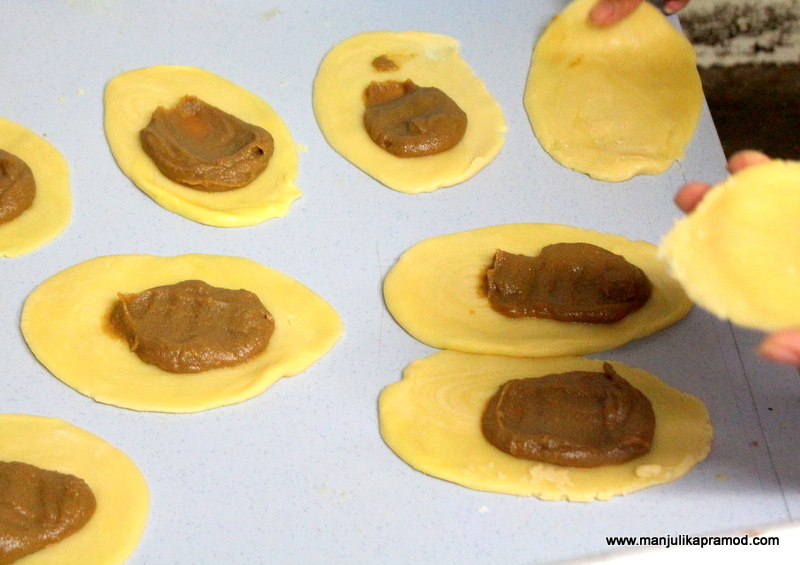 And once it was made, this filling which is also called golden coconut jam was put inside the doughs to be baked or fried as per taste. These puffs are very famous and are definitely included in the menu during weddings, festivals and celebrations. 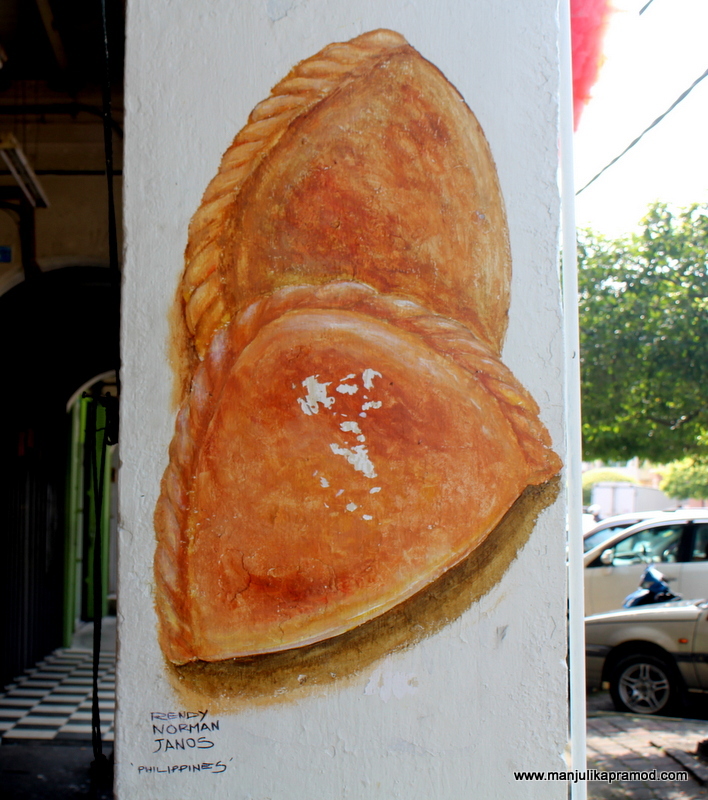 So you see how a wall art says so much about a place, its people and the food. Keep traveling, keep observing, keep appreciating art!! My trip to Selangor was organized by Selangor Tourism and Malindo Airlines. Street art really does brighten everything up. I love that so much in this town was food related although I suspect tourists do little but eat when they’re constantly reminded of all the good things around to try! Ohhh first of all I am now very curious of those Kaya puffs! I will see if I can find it here in the Asian store where I live in Switzerland. I love streetart to and those in Kuala kabu baru really are intressting. 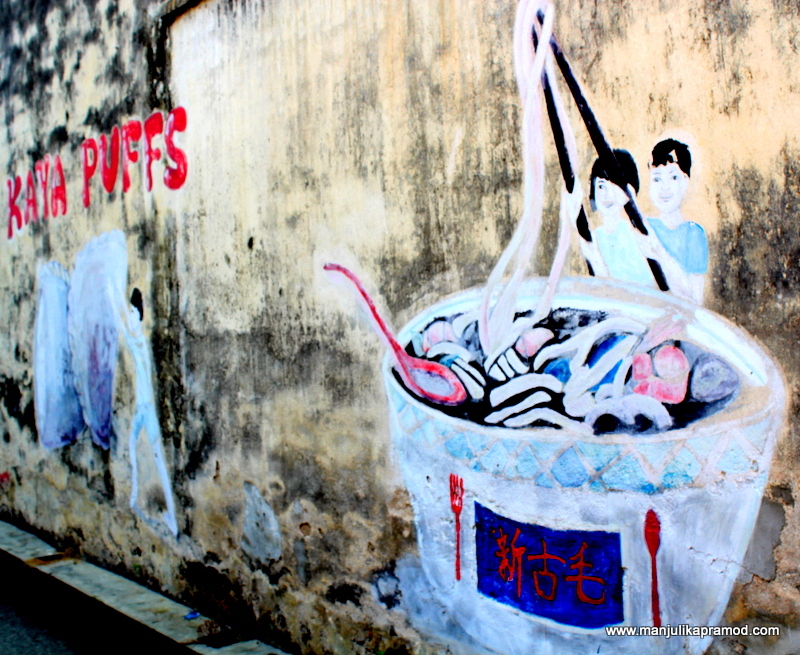 I would love to get lost on the street in KKB while eating a puff and discover one graffiti after another! The only problem with graffiti…atleast in Europe, some are not really art..they just are vandalism. I love street art like you. 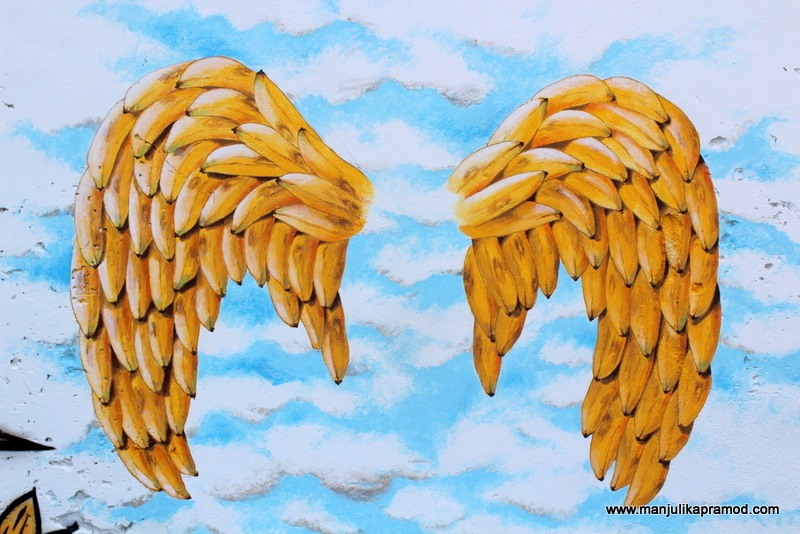 I thought of creating a niche blog on street art but never found the time. I am glad you are doing it, focusing on it. But I do not like graffiti. I draw the line there. And, although you mentioned it, you did not include any pictures of them. I completely agree with the street art saying a lot about the place and the people. I’ve never heard of Kaya puffs but they do look delicious, I can see why it’s popular there. 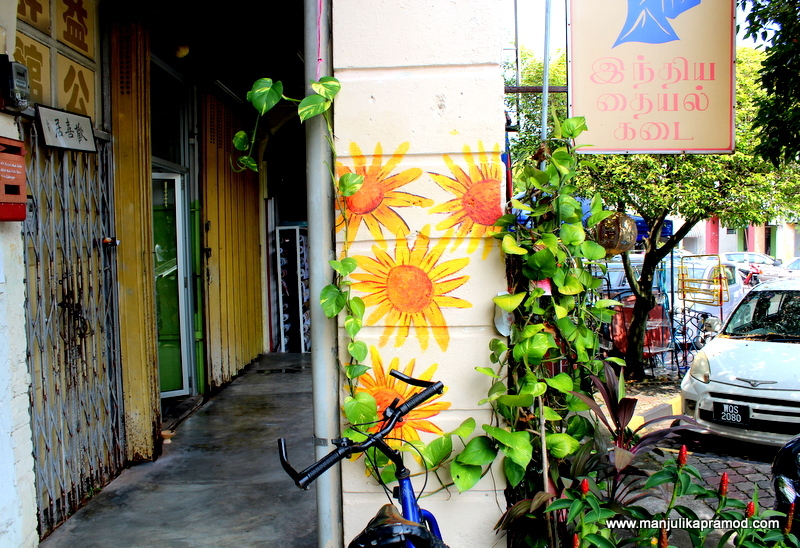 A really lovely and colourful post about this area in Malaysia; maybe one day I’ll see it for myself. I love finding cool street art when I travel too! 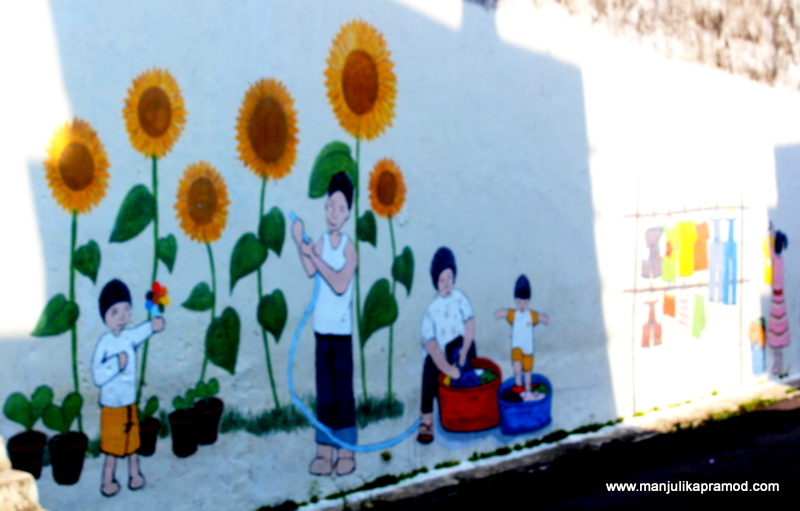 It’s so cool that each piece of street art tells a story about the local people and culture. 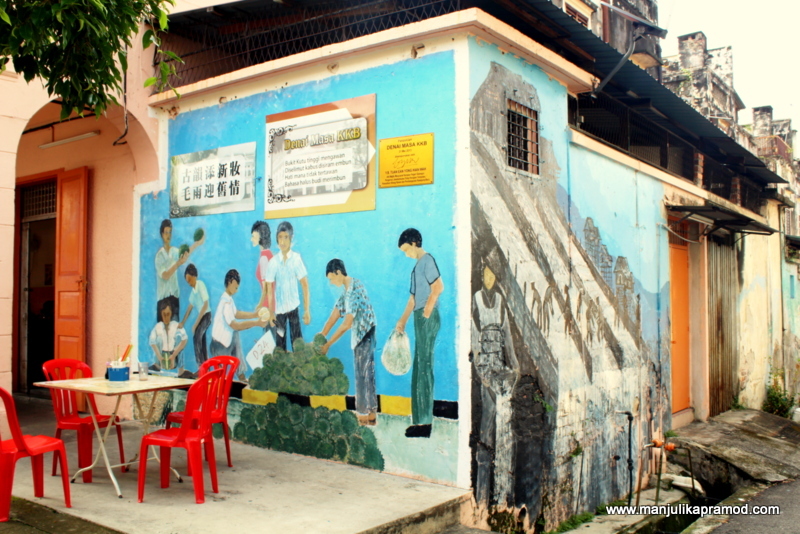 I didn’t have a chance to visit Kuala Kubu Bharu when I was in Malaysia, but I did spend some time in Penang, and there is also a ton of awesome street art in the George Town area there. Glad you got to try the puffs too – those look delicious! It seems like Street art is quite popular in Malaysia. Kaya puff looks good. I am glad you actually saw how it’s made. With so many interesting things to do here, I am including this on my bucket list. I love seeing street art when I travel, but it’s usually in bigger cities. 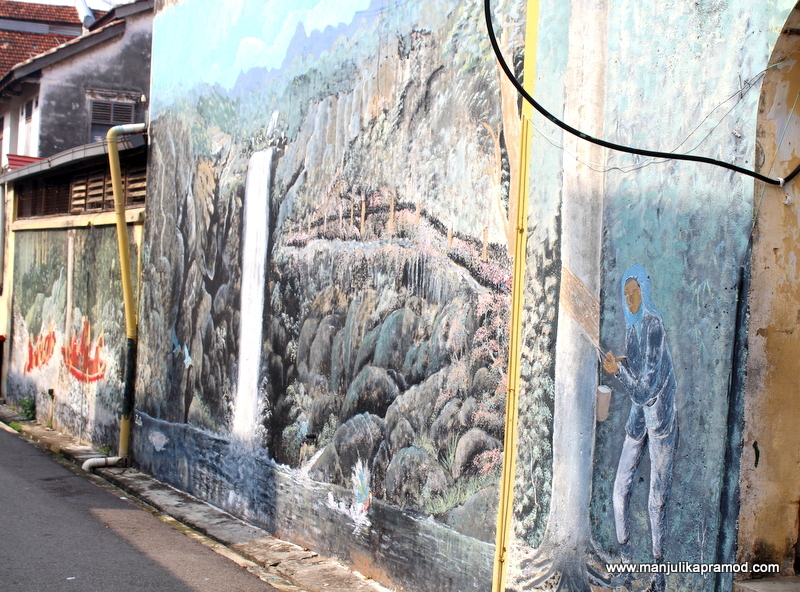 It’s great that a smaller town like Kuala Kubu Bharu is embracing street art. It looks so colourful and vibrant and I love that you can learn more about a place and it’s people from its street art. And those kaya puffs certainly look delicious. This is some lovely street art and not the usual aerosol graffiti I’m used to seeing in Toronto. I love how it conveys a meaningful political or social message about the locals and it’s not looked at in a negative light.